I met with Yves Smith of Naked Capitalism on the weekend, at a superb Japanese restaurant that only New York locals could find (and I’ll keep its location quiet for their benefit–too much publicity could spoil a spectacular thing). Yves was kind enough to post details of my latest academic paper at her site in a post she entitled “Steve Keen’s scary Minsky model“. Yves found the model scary, not because it revealed anything about the economy that she didn’t already know, but because it so easily reproduced the Ponzi features of the economy she knows so well. I have yet to attempt to fit the model to data–and given its nonlinearity, that won’t be easy–but its qualitative behavior is very close to what we’ve experienced. As in the real world, a series of booms and busts give the superficial appearance of an economy entering a “Great Moderation”–just before it collapses. The motive force driving the crash is the ratio of debt to GDP–a key feature of the real world that the mainstream economists who dominate the world’s academic university departments, Central Banks and Treasuries ignore. In the model, as in the real world, this ratio rises in a boom as businesses take on debt to finance investment and speculation, and then falls in a slump when things don’t work out in line with the euphoric expectations that developed during the boom. Cash flows during the slump don’t allow borrowers to reduce the debt to GDP ratio to the pre-boom level, but the period of relative stability after the crisis leads to expectations–and debt–taking off once more. Ultimately, such an extreme level of debt is accumulated that debt servicing exceeds available cash flows, and a permanent slump ensues–a Depression. Max Keiser and and Stacy Herbert talk about a number of topics including Charlie Munger’s must-read commentary from earlier in the week "Basically, It’s Over" and then Steve Keen is interviewed starting at about the 12 minute mark. The discussion about the impact of the China slowdown on the Australian economy is well worth a close listen since you don’t hear too much about it these days. It seems the economy down under is still viewed as some sort of a miracle system that escaped recession back in 2008-2009 and has only blue skies ahead. Steve Keen: Debt and the economy – how do we pay for all of this? Tired of the same old US-based bears such as Nouriel Roubini, Peter Schiff and Doug Kass? Sick of hearing the US is in deep trouble argument from Marc Faber and ex-pat Jim Rogers? 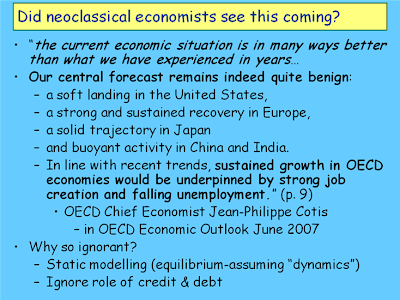 Then, for those of you who are not familiar with the most outspoken Australian Nostradamus, let me introduce you to economist Steve Keen. Keen is one person who can legitimately contend that he saw the crisis coming and even warned about the potential impacts extensively on his website. Keen’s writings serve as another example of how nonsensical the claim is that “no one could have seen this coming;” a refrain that you hear from politicians around the world who want to remain blameless for the current economic calamity. Keen is a straight shooter who pulls no punches in his criticisms of other economists, political leaders, and central bankers all over the globe. The reason it is important to listen to him now is that he is still pounding the table about the debt overhang that is plaguing the Anglo-Saxon world. Unlike the bubble-perpetuating pundits you see on CNBC, Keen does not believe economies can recover from the implosion of a debt bubble by printing money or through just the passage of time. As such, he happens to believe that both the US and Australia are on an unsustainable path that may lead to an even larger crash. Last Thursday I received an email from David Meier, Associate Advisor at the MotleyFool concerning Debt-Deflation. Is inflation or deflation the bigger threat? There are lots of people — lots of smart people — on both sides of the debate and they present lots of good arguments. One thing that I have not seen — and maybe I just missed it — was an analysis using Irving Fisher’s debt-deflation framework. So I decided to put one together myself and to inject my understanding of what Bernanke is try to do to stop deflation from taking hold. The question I keep coming back to, especially as I read more about the situation Japan faced (I’m reading everything I can by Richard Koo, including his book "The Holy Grail of Macroeconomics." And just to make sure I am not being one-sided, I am countering my fears of deflation with "Monetary Regimes and Inflation" by Peter Bernholz, which should arrive next week. Without further ado, below is my research on debt-deflation. Dave’s research is a 70 Slideshow Page On Debt-Deflation that is easy enough to read or download from Scribd. Here is my response …. You should not be afraid of deflation. You should be afraid of policies attempting to fight it. Deflation (rather price deflation) is actually the natural state of affairs. As productivity increases, more goods and services are produced relative to the population and prices would therefore be expected to drop. It is the Fed, along with misguided Keynesian and Monetarist economists who think falling prices are a bad thing. Who amongst us does like falling prices (except of course on things we own like houses, but even then who is not sick of higher property taxes that result)? The reality is inflation benefits those with first access to money. Guess who that is? The answer is easy: banks, government, and the already wealthy. Inflation is actually a tax on the middle class and the poor who get access to money last. During the housing bubble, by the time the poor could get access to to money easily, it was far too late to buy. Is Pent-Up Inflation From Fed Printing Waiting On Deck? Inquiring minds are wondering about the possibility of "pent-up" inflation from the massive expansion money supply by the Fed. Our search for the truth starts with the question "Which Comes First: The Printing or The Lending?" 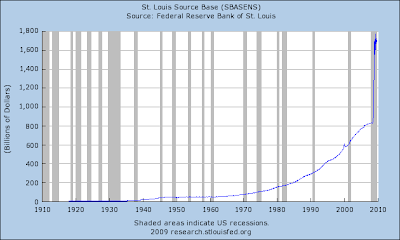 Since the beginning of the recession, the Fed has expanded base money supply from $800 billion to $1.7 trillion. Conventional wisdom suggests this money is going to come soaring into the economy at any second causing hyperinflation on the notion banks will lend out 10 times the amount of reserves. So is this pent-up inflation just waiting to break out? A funny thing happened to the inflation theory: Banks aren’t lending and proof can be found in excess reserves at member banks. In practice, banks are insolvent, unable or unwilling to lend. 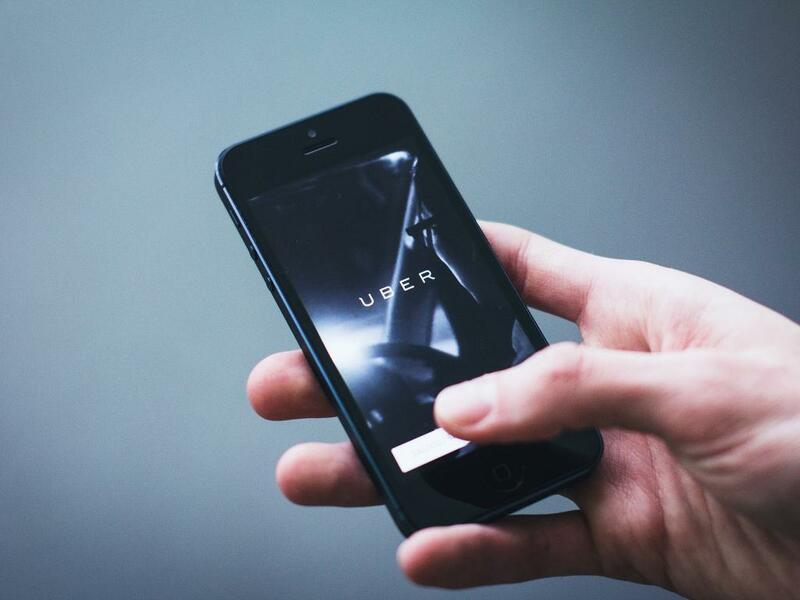 Moreover, tapped out consumers are unable or unwilling to borrow. As a result, Spending Collapses In All Generation Groups. 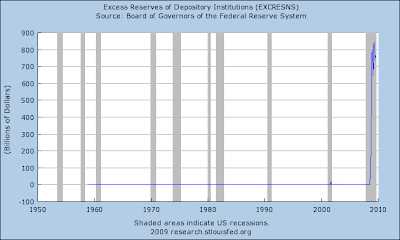 Bernanke can flood the world with "reserves" and indeed he has. However, he cannot force banks to lend or consumers to borrow. Yet every day someone comes up with another convoluted theory about how inflationary this all is. It is certainly "distortionary" in that it creates problems down the road and prolongs a real recovery by keeping zombie banks alive (as happened in Japan). 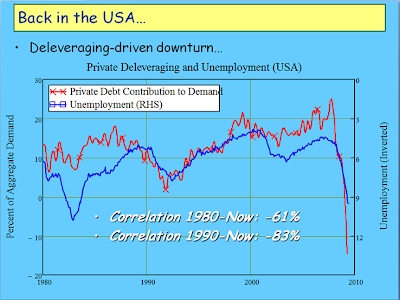 However, it is not (in aggregate) going to cause massive inflation because it is not spurring the creation of new debt. Consumers and banks both are suffering from a massive hangover. Their willingness and ability to drink is gone. No matter how many pints of whiskey Bernanke sets in front of someone passed out on the floor, liquor sales will not rise. In a debt-based economy, it is extremely difficult to produce inflation if consumers will not participate. And as noted above, demographics and attitudes strongly suggest consumers have had enough of debt and spending sprees.